A while back I mentioned that my daughter's Religious Education (e.g. "Sunday School") program uses a curriculum called Spiritplay. It is Montessori inspired program where the kids listen to stories from various traditions, and then have a chance to respond to them verbally and artistically. I am one of the six teachers who rotates through the classroom, taking turns as the Storyteller; and an additional part of my commitment involves making some of the Storykits, which contain the props that the Storyteller uses when s/he sits with the children and tells the story. So, last November, the team leader e-mailed me two stories for which I needed to create (or purchase) the props. The first story was a simple one involving birds and snowflakes, and I was able to get by with cutting some shapes out of acrylic felt and throwing them in a decorated box. The second story, however, involved an ox; and the ox needed to pull ten carts. And while I could have have just done the cheap felt thing again, I thought that three-dimensional props would be much better. But. There aren't a lot of toy oxen around--have you noticed? Enter this bizarre pipe cleaner armature: the beginning of a felted ox. 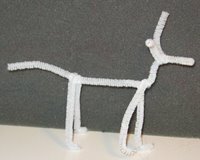 Believe it or not, after you wrap lots of wool around it and poke it many times with a felting needle, it ends up looking like the brown animal in the next picture. I think he came out pretty well, overall. There is also an ox calf on the right hand side of this picture, although it is difficult to see. And I forgot to put a coin in for scale, but I would guess that the ox is about four inches tall. The people are supposed to represent a merchant and the woman who takes care of the ox. 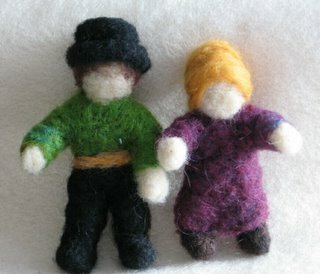 They came out sort of Amish looking, don't you think? I ended up spending way more time on this project than was really called for, and I neglected to take a picture of the ox pulling the ten carts (which were not made of wool) before I delivered the storykit to church today. But the process was so enjoyable! And I was so happy with the results! I really did not want to give these little creatures away. 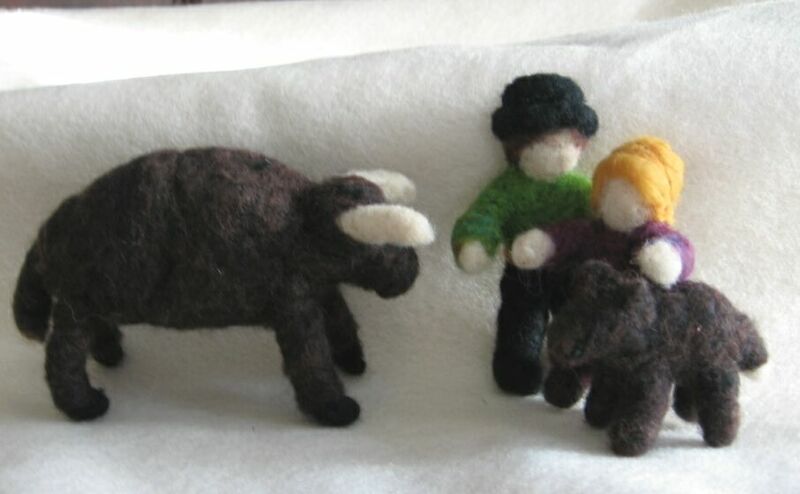 I continue to be amazed at the magic of needle felting. As someone who could never draw or paint well--and who always felt like a "non-artist" because of this--I find needle-felting to be a true joy. It is an incredibly forgiving and flexible medium. Yes, once something is truly felted you cannot un-felt it, but during the process there are so many ways that you can change the shape and direction of the work. Once I get into the "flow" of a felting project I could just continue working on it for hours.